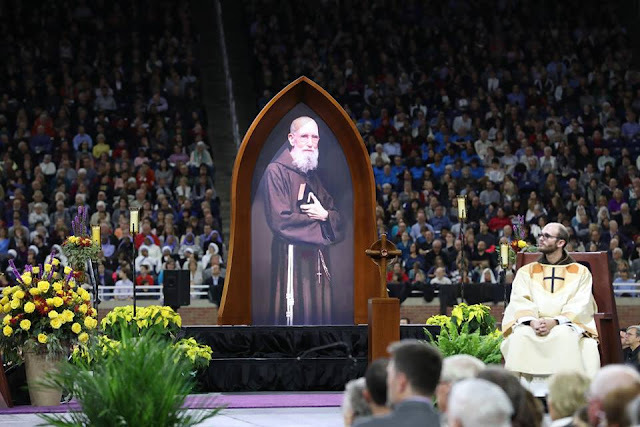 The Catholic Archbishop of Detroit presided over the beatification of Father Solanus Casey who is only the second U.S.-born man to be beatified. The beatification Mass took place in the U.S. city of Detroit on November the 18th in an Athletic Stadium with 66,000 people present. Father Solanus was born in Wisconsin and joined the Capuchin Franciscans in Detroit in 1898. He was particularly helpful to the poor and reports of miraculous favours attributed to his prayers began to spread throughout the region. He died in 1957 at the age of 87. His beatification came after the miraculous healing of a Panamanian woman was attributed to his intercession. Archbishop of Detroit, Allen Vigneron: said the beatification “fills us with gratitude and joy” and confirmed "our own sense of the holiness” of Father Solanus. He described the Capuchin priest as a “most beloved figure” within the Catholic community of Detroit and far beyond that. “He was very humble and devoted to his vocation” …… "and connected to people very powerfully,” Archbishop Vigneron said.